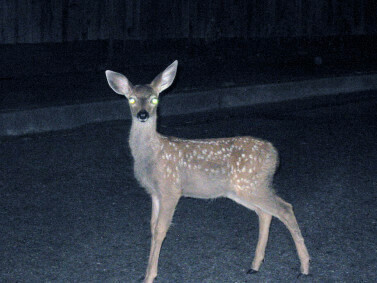 There’s a certain deer-in-headlights expression that creeps onto a sprayer operator’s face when we start talking about nozzles. I profess some sympathy for my field sprayer clients given the overwhelming variety of nozzle styles they must choose from, but I reserve most of it for the airblast operators. The reason being that horizontal booms carry the same rate in each nozzle position, but many airblast operators distribute their output unevenly over the boom to optimize spray coverage… and it’s not easy to do. Which nozzle should I buy!? The question of “which rate goes where” is still debated. It’s led to diagnostic devices called Vertical Patternators which show the profile of the spray. 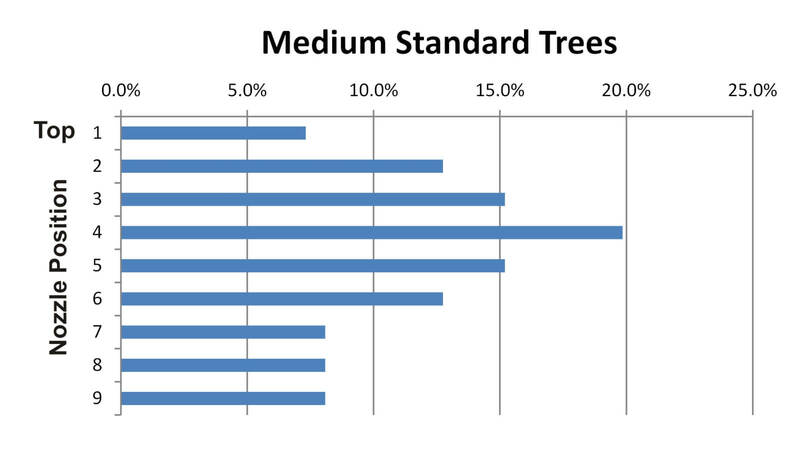 Operators can use these to visualize their distribution… but they are few and far between. For the rest of us, deciding on the best distribution begins with understanding how the practice evolved. Spoiler alert: Nozzling an airblast sprayer is a process that requires the operator to understand which factors affect droplet behaviour. If you want a silver bullet, stop reading. The AAMS-Salvarani vertical patternator. 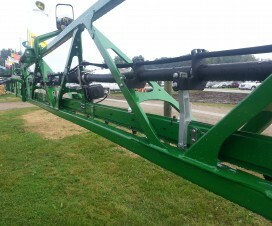 The mast moves back and forth across the swath of a parked sprayer. Each black collector intercepts the spray at different heights. The fractions collect in the tubes at the bottom to show relative volume. 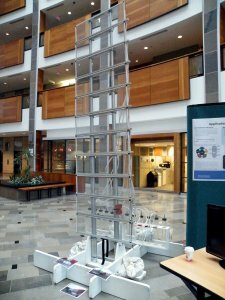 An OMAFRA-built vertical patternator. 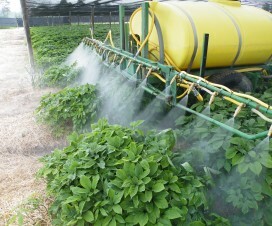 The sprayer parks in front of the screens, which intercept spray. It’s collected in troughs and runs into columns that show relative volume. In the 1950’s, the mantra was to blow as much as you could, as hard as you could, and hope something stuck. 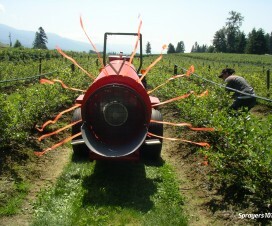 At the time, John Bean promoted a method called “The 70% Rule” whereby operators used full-cone, high volume disc-core nozzles to emit the vast majority of the spray from the top boom positions. John Bean provided a slide-rule calculator to help operators configure booms to align the top nozzles with the deepest, densest portion of the 20-25 foot standard trees they were trying to protect. Back then, most airblast sprayers were engine-driven monsters capable of blowing to the tops of those trees. The practice persisted into the 60’s and was encouraged by Cornell University (Brann, J.L. Jr. 1965. 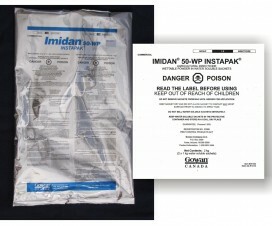 Factors affecting the thoroughness of spray application. N.Y. State. Arg. Exp. Sta. J. paper no. 1429). In the 70’s, extension specialists began advising operators to tailor the distribution to match the orchard spacing, tree architecture, canopy density and weather conditions. 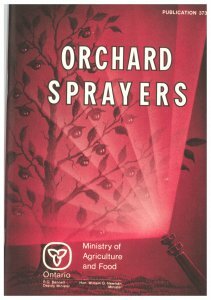 I reached deep into my archives for the Ontario Ministry of Agriculture and Food’s 1976 publication entitled “Orchard Sprayers” to see what we used to tell airblast operators. Choose a tree size and shape that is typical of your orchard and park the sprayer at the normal spraying distance from it. Find one or two middle nozzle position(s) and air deflector or vane settings that direct the spray up through the top-inside of the tree. This is called the “middle volume zone”. Find rates that will give a large output in this middle volume zone, and smaller outputs for positions above and below. The total output must still add up to the target volume. Operators followed this approach well into the 80’s, as they endeavored to aim the majority of the spray into the densest part of the canopy. Many can relate to the following illustration that divides the boom. The fractions represent the portion of the available boom. The percentages indicate the relative volume. Of course, it matters how large and how far away the target is for either the 2/3-boom or 70% rule to make sense (the middle volume zone is shown receiving 65-70% in the silhouette). [Historical] recommendations are to use a larger nozzle at the top of each side, with the capacity of the top nozzle at least three times greater than other individual nozzles. However, results in this study with three different spray techniques showed that spray deposit was uniform across the tree canopy from top to bottom with the equal capacity nozzles on the air blast sprayer. So, how do we do it today? I said there was no silver bullet. 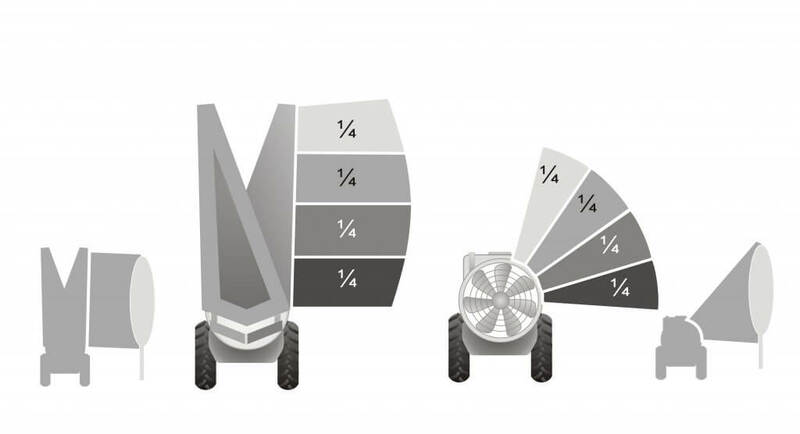 Conditions change, not all sprayers are the same, and not all applications have the same target. Let’s build on what we’ve learned to establish a process to achieve better coverage uniformity AND reduce waste (e.g. drift). No matter the crop, the operator must first adjust air settings. Air volume and direction play the most critical role in transporting a droplet to (and into) a target canopy. Too high an air speed will cause spray to blow through the target, rather than allowing it to deposit within. Aim the air just over, and just under, the average canopy. Ensure there’s enough air to overcome ambient wind and to push the spray just past the middle of the target canopy. It should be noted that we assume the operator is spraying every row. With the possible exception of a new planting, alternate row middle spraying is not recommended. Not only does it compromise coverage on the far side of the target, it makes it far harder to match the nozzling on a radial sprayer and is a sure-fire way to increase drift. Next, determine which nozzles are not needed (e.g. spraying the ground or excessively higher than the top of the canopy). 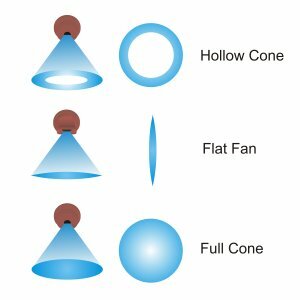 Remember: hollow cones overlap very close to the boom and spread as much as 80°. Airblast sprayers rarely if ever need the lowest and highest nozzle positions. 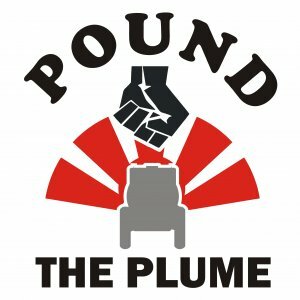 Turning off the highest, and most drift-prone, nozzle positions is illustrated very nicely in the logo of Washington’s 2017 Pound the Plume awareness campaign. High humidity means more spray will reach the target, and vice versa, because of evaporation. 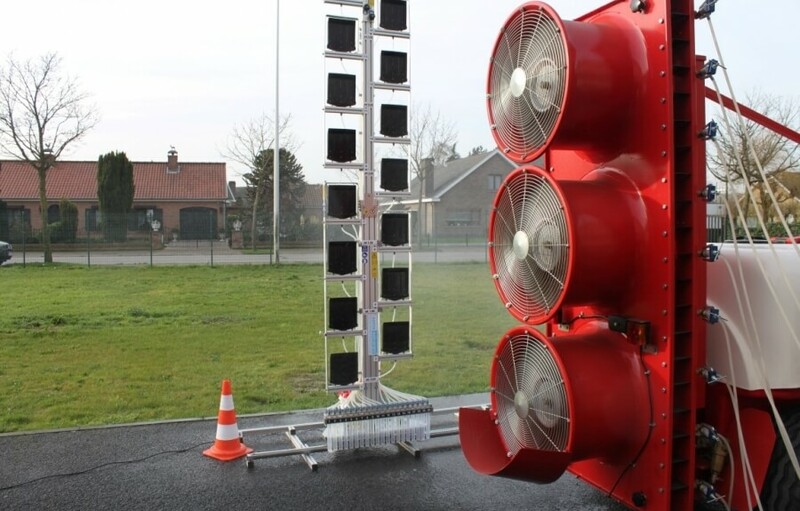 Larger droplets are less prone to evaporation and deflection by wind, but will fall because of gravity as the droplets gets further from the sprayer. It is said a droplet can lose ½ its diameter every 10 feet. Using a Coarser spray quality in the upper boom positions may help overcome this, without having to use more volume. Added benefit: far less drift! Wind is faster the higher you go, so spray is most likely to deflect at the top of canopies where they are already evaporating and losing momentum. 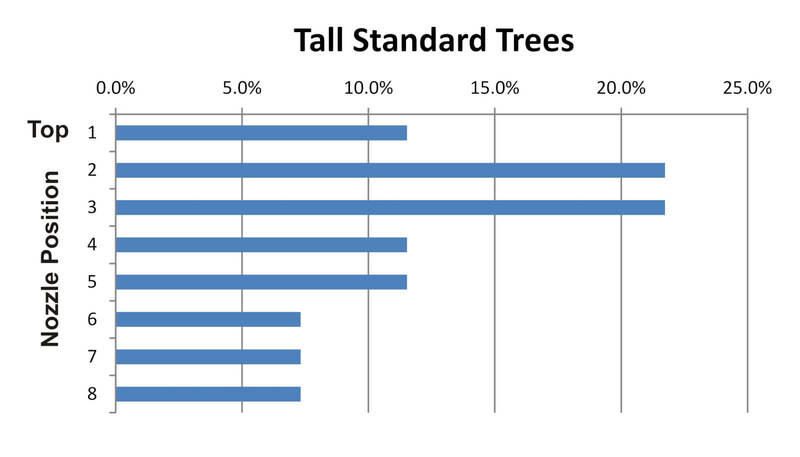 Early in the season when there is little if any foliage, wind speeds are higher overall. This is why we advise adjusting air settings before considering boom distribution – you need enough air volume, aimed correctly, to get the spray to the top. Dense targets will filter more spray as you get deeper into a canopy. Finer spray can penetrate more deeply because there are more droplets and they move erratically, whereas Coarser droplets move in straight lines and impact on the first thing they encounter. Further to the last point, remember that it’s the air that propels the spray, not the pressure. Higher liquid pressure can propel Coarser droplets further, but has little effect on Finer droplets. Consider throwing a golf ball and a ping pong ball. Plus, the higher the pressure, the Finer the mean droplet diameter. To know how all these factors play out, you must use water sensitive paper (or some other form of coverage indicator) to diagnose the results. Remember, the goal is uniform coverage and for most foliar products, we want to achieve a minimum coverage threshold of 15% and a droplet density of 80 Medium droplets per cm2. 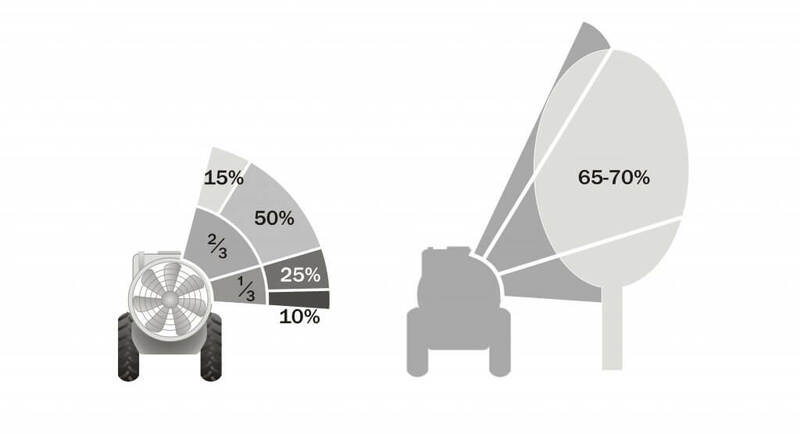 Taking the time to match your output to the target has the potential to greatly improve coverage and reduce waste. Nozzle body flips and quick-change nozzle caps make the process of switching nozzles between blocks fast and easy. It’s worth it. Grateful thanks to Mark Ledebuhr, Gail Amos and Heping Zhu who edited, corrected and contributed to this article. It’s far better thanks to your input!